In 2008, at the age of 45, when I was doing my training to become a nurse, I lost my dad and two weeks after, I started to feel tired. I went to the doctor and he suggested that I have a couple of blood tests but he thought it was probably stress. I left it a week or so before I went back but when I did, my blood test results had come back and I was immediately admitted to the Royal Derby Hospital that day. Tests followed by more tests but still no answers. Two weeks later, I went for a scan on a Wednesday evening, when I was told that I was to be transferred to Birmingham Queens hospital for an emergency liver transplant. I wasn’t expecting that! I was put on the 'super urgent’ list. I was told that without a transplant, I wouldn't live longer than 72 hours. I was so scared, miles away from home and all alone. On Friday, two days after my last scan, I was told that they had a liver. Following a test later that day, they told me the liver was too big and wouldn’t fit so they needed to find another one. This was a very scary time as they said my liver would only last a couple of days. Saturday came and again they said we have a liver. This time, I didn’t really get too optimistic. Then I suddenly realized that someone was losing his or her life for me to live. This really messes with your head but, due to toxins in my brain from my liver not working properly, this didn’t really hit me fully till after the operation. It took me a year and a half to get over the numerous stays in hospital, with incision Hernia, ascites and having to have a stent put in. When I came out in February 2009, I couldn’t walk, open a bottle of milk or get off the sofa without help. I had lost all my muscle, but I worked hard and my aim was to take part in sport again. I started swimming with a rubber ring, which was strange because only months before I had found doing 50 lengths in the pool easy. Next I tried my hand at cycling. I bought an old bike off eBay and took part in a cycling race in Bath in 2010. I got lapped and said I would never get on a bike again...But guess what I did? Next, I then got picked to go to the World Transplant Games in 2011. This motivated me to start some serious training, which paid off as I got a Bronze medal in cycling. . This just goes to show with a positive attitude and a lot of hard work anything is possible. Next stop was South Africa for the World Transplant Games in 2013. The training went up to another level as I was determined to get a Gold medal. This was not only to promote organ donation but to do my organ donor proud so I could say to them that by signing the organ donor register, they have made a huge difference to someone’s life. This time, at the World Transplant Games, I won a Gold medal, which was presented to me in front of both my mum and daughters. I will always be in awe of my hero, my donor. She gave me the chance of five extra years with my daughters. Then in 2015 in Argentina I went on to win two Gold medals in Cycling again. In 2017, the World Transplant Games were held in Malaga, not so far to travel. Jess, my daughter, came with me. It was so hot we were racing in temperatures over 30 degrees which was unbearable. But I went on to win two Gold medals in the Time Trials and Road Race which was a hard race. But again I did this for Helen my Hero and for Amazing Alice who was my young friend who lost her fight earlier this year. Alice and I always said we wanted to ride in the games together but this sadly was not to be but on that day Alice was firmly in my sights and my thoughts. 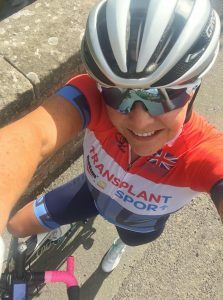 Now, in 2018, I am getting ready to compete in the European Transplant Games in Sardinia, and celebrate 10 years of having my life saving transplant that will be finished off by competing in the British Transplant Games in Birmingham were my journey started, My Home Team. I owe my life to Helen my Hero and my family for their support.